Foro Empresarial COPARMEX Mazatlán, 26 Nov 2010 No. 2 | ¡VidaMaz! 2. A model for how to lead change efforts by communicating clearly, simply, powerfully, and from the heart. Any errors in this blog post are either due to faulty note taking or poor hearing, and are, thus, my own. Likewise, I am confident the speaker was far more eloquent and persuasive than my accounting of the speech will be. 3. Corruption (a “culture of illegality”). He reminded us of the saying frequently attributed to Machiavelli, that “the ends justify the means.” He made the point very strongly that for him it is just the opposite: the form, the means, achieve the ends. He explained that we couldn’t achieve good results using less than good means. We must be clear: there are no good drug dealers. When money is raised through illicit means, it is rooted in death and destruction; it cannot have a good outcome. He urged the 14 mayor-elects and the governor-elect who were present that to combat violence and bring dignity to society government must have transparency. 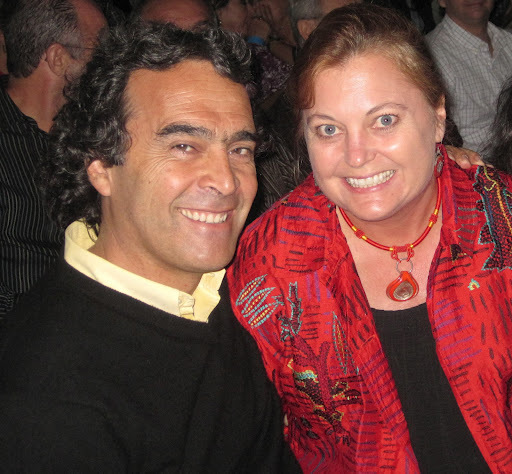 Dr. Fajardo explained that he grew up in Medellín. He is a math professor who would sit around with his professor friends and complain about politicians. After so much complaining he decided the responsible thing to do was to roll up his sleeves and do something about his beloved city’s problems. But he’s a math professor, what did he know about politics? Dr. Fajardo explained that one thing he feels they did right is they did not buy any votes. They gained political capital by going out and talking with the people, listening to them, gaining their trust. Voter turnout the year they were elected was the highest it has ever been. When they took office people of course came to them, asking for positions, for favorable contracts, as people are used to doing. They refused. They wanted transparency. They were not elected in exchange for favors or gifts, and they were not about to extend favors now. Business would be conducted transparently, on the basis of merit not connection. The people in the community developed trust in their elected leadership, because of this transparency, because of their accessibility. He explained that there was incredible value, immeasurable social capital, in trust. “Even WalMart doesn’t sell trust,” Dr. Fajardo joked. 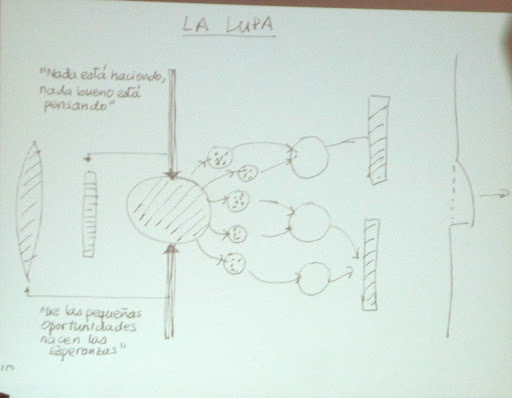 Dr. Fajardo shared another slide with us that addressed the problem using metaphor. There are two trees: one tree represents violence, the other social inequity. 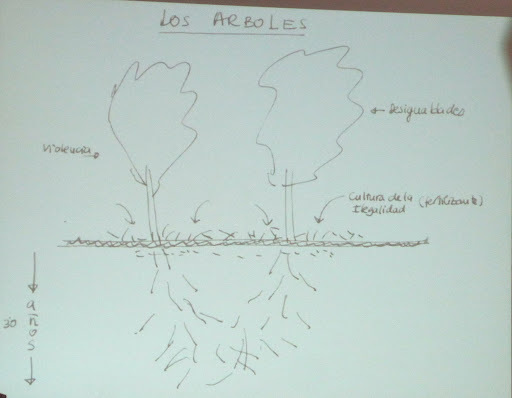 The trees grow in well-fertilized soil: in a culture of illegality. The two trees have been growing close together, in such fertile soil, for so many years that their roots are completely intertwined. It is hard to distinguish, from the roots, where one tree begins and the other ends; they grow almost as if they were one tree. The trees are tall and strong, and very deeply rooted. Even with all of society pulling together in unison—something very difficult to accomplish—we wouldn’t be able to uproot both trees in one feel swoop. Thus, the intelligent way to proceed would be step-by-step, one step at a time. But how? What would the first step be? Here Dr. Fajardo relied on his mathematician background: he gave us an equation. 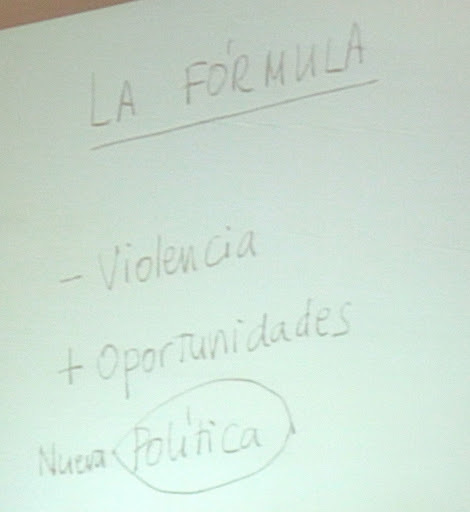 Lowering violence and creating opportunities will bring about a new politics, a new way of life. He repeatedly cautioned that change would not happen overnight, that there would be major setbacks and backlashes along the way. But, step-by-step, we could reverse the downward spiral and begin rebuilding our societies. 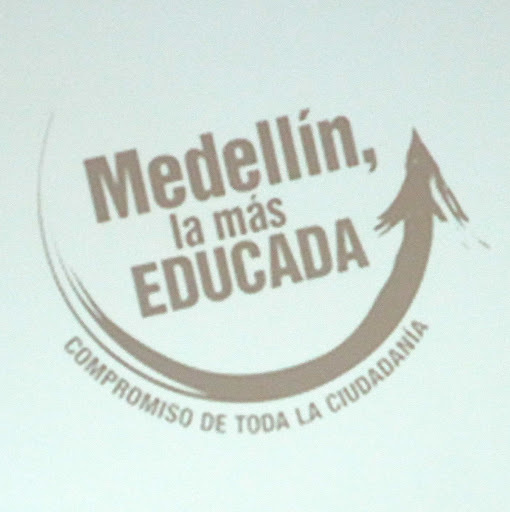 In the case of Medellín, reclaiming community has taken twenty years, and it is still a daily, continuing battle. For me this was so important to hear. It is hope tempered with realism. It is not the untethered hope presented by President Obama’s campaign, but the hope we so desperately crave, anchored in the reality that the road to get where we want to go will be long and difficult. 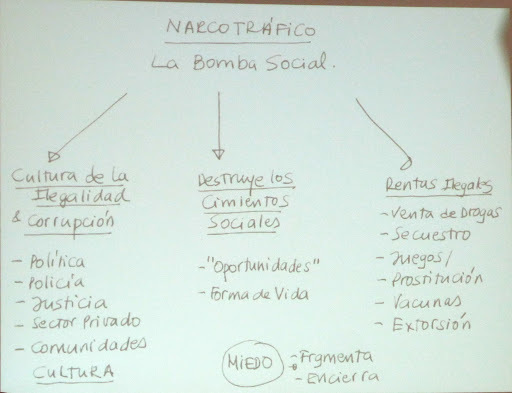 Dr. Fajardo used this slide to illustrate how one powerful man (his name was never spoken, sort of like Voldemort ☺ ) had complete control, terrorizing the people, in the 80s and the first half of the 90s. 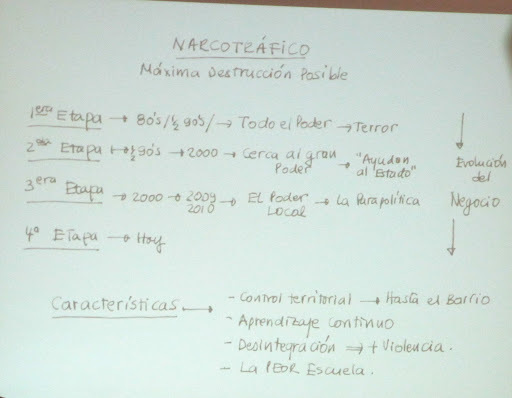 There was control of territory “hasta el barrio.” There was continuous apprenticing and tutoring of new drug dealers, a clear “management development” plan, if you will. By the latter half of the 90s, though a criminal, this man was very near power; he was “helping the state.” He wanted to be president. But from 2000 through 2009/10 the tide turned toward local power, toward participatory politics. And, today, while there remains much progress to be made, people go out in the streets again. One of the many beauties of Dr. Fajardo’s presentation was how frequently he returned to the main point. He reminded us that there are no favorable consequences to drug trafficking. He reminded us that it is a culture that can take over; that here in Sinaloa we even have narco corridos. The narco culture is such that a common saying is “I’d rather live one day rich than a long life poor.” They live by different rules, different guiding principles. (Those of you interested in this culture may be interested to read a former blog post I wrote on Jesús Malverde, “patron saint” of narco traffickers). Here we were treated to another powerful slide. Such simple drawings; they created confidence that these are problems that indeed can be analyzed, can be dealt with, step by step. 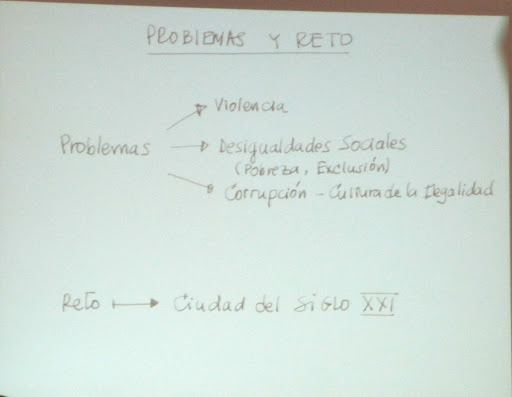 The core problems are that there is a corridor, a culture, of delinquency and violence. And that corridor has two doors: an entrance and an exit. Why do people enter the corridor of delinquency and violence, and how do they exit it? If we can understand those doors and how they work, we can close the entrance and open wide the exit! Ah, so simple! So hopeful! The person then enters the door to the illegal life (the circle in the center of the drawing), by joining his friends, or the people he aspires to be (who seem to have some money, some friends, who seem to be cool), who hang out on the street corner. The young person progresses in the life until he hits a wall. That is the “are you with us or against us” wall. According to Dr. Fajardo, the key to the process is that first door. There is a need to close that door! And how do we close that door? By opening others, by providing things for the young person to do, people for the young person to hang out with. As opportunities increase, the door to the illegal life closes, little by little. 1. Politics: to create trust via transparency and participation. 2. Social urbanism: integrated urban projects, where people could go to enjoy time together. 3. Youth: Youth of the Future, adolescent pregnancy prevention, cultural networks. 4. Knowledge: education, science and technology. 5. Innovation and stimulation of culture. 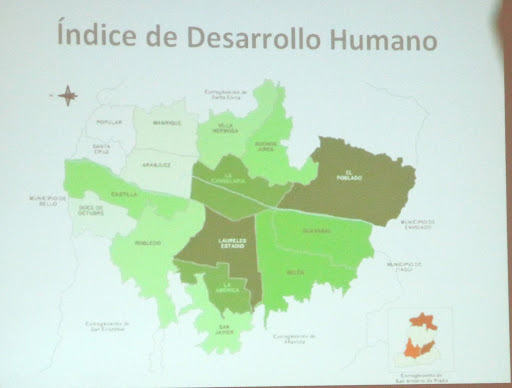 They began their efforts by getting out a map of Medellín, and looking at where the needs were highest. They strove to understand what was happening on every street corner, to know which communities were at highest risk, had the poorest living conditions. 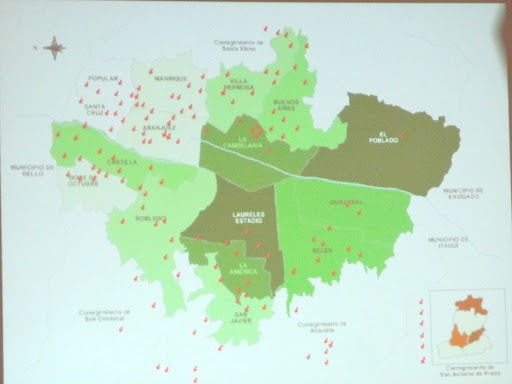 These maps show the city of Medellin, and the red arrows show where they built major “social urbanism” projects. People wanted more police, more fences. They were afraid to go out; they locked themselves in and stayed at home out of fear. No! The answer had to be to create safe public spaces, to motivate people to meet each other and enjoy one another’s company. There were no handouts; people in the poor areas could not stand around waiting with their hands out. They had to pitch in, to participate, to form, create and manage those public spaces. 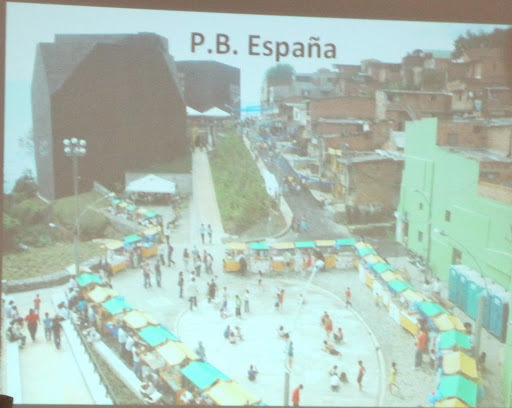 Dr. Fajardo showed us photos of quite a few Parques Biblioteca or “Library Parks,” that were built during his term as mayor. In each case, people in the local community played a key role. They were built in the poorest barrios of the city. They included play areas, learning areas, areas for creative and social development, where kids could learn about nutrition and health. Always they were designed with the finest architectural elements, so they could be the pride of the community. We also saw photos of Colegios de Calidad, or public “Schools of Excellence.” These became places where the poorest girl in the city could go to a school as beautiful as, or even more beautiful than, the richest private school in town. In this way children and parents could feel hope, could start to feel like doors were open, that they had options for social mobility. They built CEDEZOS, or centers for new/small/micro business development, as part of their strategy. Again, people asked them to hire them, to give their children or wives jobs. “This sort of thing happens in Colombia, but I’m sure it doesn’t in Mexico, right?” Fajardo wryly asked. They obviously refused such requests for favors. He explained that they also admonished people not to hire a bunch of secretaries to staff these centers; that they were public spaces, run by the local community, and all should be merit based. They also built an aquarium and a botanical garden, again, in the most humble areas of the city. This served multiple purposes: attracted people to visit, attracted additional investment, gave the locals a sense of pride and provided opportunities, and it gave everyone in the community more safe public spaces in which to socialize and learn. We saw before and after photos of a 19th century home, transformed from dilapidated to a beautiful Casa de la Lectura Infantil. There were cultural centers, including one designed by the internationally renowned architect Rogelio Salmon, now deceased. There were bridges, spanning previously murderous gulches and now linking communities together rather than separating them. We saw shantytowns transformed into multi-unit housing developments surrounded by lush green spaces. All of the library parks, schools, business centers were gorgeous, some of the most beautiful you might see anywhere in the world. They were paid for with tax money, moneys targeted for other things (such as beauty contests) and now re-targetted to education and to public works. I will write post #3 in this series as soon as I’m able. I trust I am communicating to you a bit of the knowledge and passion that I witnessed yesterday at the Foro. Dear Dianne,This is my first time in your blog; i have to say that I admire the fact that you are an expat woman interested in what is going on in here in a deeper way.I am a 27 years old girl who actually lives in Mazatlán. I have just moved from Monterrey and I am amazed of how much you and other expats love this town. It is like watching this place with different eyes! My family lives here and I had to move back because all of the crime and violence that now prevails in Monterrey… but somehow I feel that something is missing in my life in Mazatlán.Your blog made me realize that there's more to see, to try, to do for this place… I just hope to have the guts to DO IT just as you do.Happy holidays!